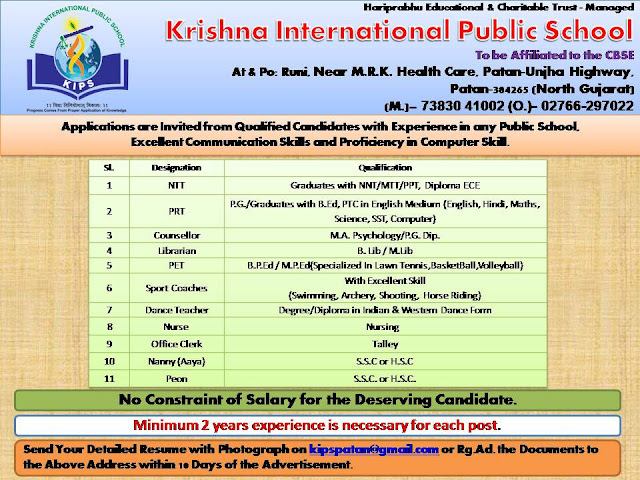 Krishna International Public School (KIPS) has published Advertisement for below mentioned Posts 2017. Other details like age limit, educational qualification, selection process, application fee and how to apply are given below. How to Apply: Interested Candidates may send their detailed resume with a photograph on kipspatan@gmail.com or Reg. Ad the documents to the address given in the advertisement within 10 days.